Ben Affleck, the rumors are swirling that you want to give up playing Batman. Please don’t. The Internet can be a beautiful, wonderful place full of information, inspiration, and innovation. Unfortunately, it can also be a putrid pit of negativity. It certainly seems as though only those with vile complaints take the time to make their voices heard on the Web. Well, Ben Affleck, it’s time to spread some positivity. I’m a lifelong Bat-fan. As a forty-year-old high school English teacher (and, yes, I am working on a novel—it’s mandatory), Batman has been a constant in my life since 1980. For the English teachers out there, that’s thirty-seven years. I’ve enjoyed Batman teaming up with Scooby-Doo, I loved the Super Friends, Adam West will always hold a special place in my heart, Michael Keaton and Tim Burton blew my mind, The Animated Series proved itself a masterpiece, Frank Miller scared me while aweing me, Val Kilmer didn’t scar me, George Clooney kinda did, and then Christian Bale and Christopher Nolan took Batman someplace both old and new in a way that felt important. But you, Ben Affleck, you’re doing something that’s never been done before. You are laying the groundwork for a cinematic Batman that must play with others. No one else had the guts to do what you guys are doing. No one else dared put Batman’s dark costume on the same screen as the Flash’s, Wonder Woman’s, or Superman’s only slighter less dark costume. You dared take Batman back to his vigilante roots, and you are brave enough to depict his evolution not only into a team player, but the heart and soul of the Justice League. Batman has endured a long and illustrious cinematic life, but you are truly breaking new ground. I know the trolls have been really tough on you. I understand you are sick and tired of fielding questions about a movie you haven’t even started filming yet. I recognize that the expectations are impossible to meet. In the here and now, you have a thankless job. But please keep the big picture in mind. You have a vision for where you want to take this character. You see the end result, though it may be years away. In time, people will appreciate you and your efforts. You will win over the haters, trust me. How do I know this, Ben Affleck? I’m a diehard Batman fan, and you won me over immediately. I am being totally honest when I say that I loved Batman v Superman. I acknowledge it as the initial step in a marathon. Of course Batman and Superman wouldn’t get along at first! But, with his death, Batman realizes the great ally he’s lost, and with Superman’s eventual return, both men will recognize even further the good they can do. In a way, Justice League will echo The Lego Batman Movie – Batman is ultimately a family man. The orphan always builds his own family. He has an army of Robins and a multiverse of teammates. The aloof Dark Knight is nothing of the sort. You are depicting the advancement of a brooding cynical man believing in heroes again and leading those heroes to a better tomorrow. In the end, everyone will see that. So, please, don’t step away. Don’t interrupt the journey you’ve begun. Anytime you’re feeling blue, get in touch and I’ll build you back up. Want to know why you’re my third favorite Batman? (Sorry, you’ve yet to top Adam West and Michael Keaton. You’ve got to win over my inner child with those two guys and I just don’t know if that’s possible.) First of all, you’re big, man. I mean, you’re a really big dude. Batman is also a big dude. And, please don’t take this the wrong way, but you can deliver the smug, arrogant Batman/Bruce Wayne for which we’ve all been pining. There’s an intelligence behind your eyes that make us believe this is the world’s greatest detective. You ooze charm, both with the mask on and off. You can look intimidating as hell one minute, and then project a heart-breaking inner turmoil the next. You’re able to take every dimension of Batman that we love and combine it into your performance. Furthermore, you’ve got great chemistry with Gal Gadot, and Batman must always have chemistry with Wonder Woman. It’s geek law. Ignore the hate, Ben Affleck. Persevere. Know that you’ve really struck a chord with Bat-fans everywhere. Sadly, as a society, we’re slow to heap praise. Well, I’m heapin’, baby! I believe in your vision, your performance, and your interpretation. I believe, in the end, you will be the Batman for generations to come. Of course, this could all just be a power play to gain leverage on the studio for some reason. In which case, I wish you luck. Whatever the case may be, my sentiments remain unchanged! I should explicitly state from the beginning that I am an unabashed Batman fanatic. I discovered him at the age of three and have loved every incarnation of him during the past thirty-six years. Furthermore, I’ve always leaned toward DC Comics, home of Superman, Batman, Wonder Woman, Flash, etc. With all that being said, I am certainly bias. Therefore, it comes as no surprise that I loved Batman v Superman. I am, after all, a fan boy. I also want to make it clear that I’m going to work hard to convince you to see this film and ignore the misguided negative reviews it’s apparently received. I say “apparently” because I’ve read no reviews of the film at all. I wanted to go in open-minded. I’ve heard it’s gotten bad reviews, but everyone I’ve personally spoken with, and watched it with, loved it. So, apparently, someone out there isn’t a fan. First of all, it’s a visually stunning movie. Like with Man of Steel, director Snyder is showing you the characters in all their glory. Batman looks like he stepped right out of a comic book and uses brutal physicality. Wonder Woman is portrayed as the intelligent warrior we all know her to be. Superman does the things only Superman can do. Snyder knows these characters and shows us what we want to see from them. I found myself surprised by the acting in the film as well. Affleck nailed Bruce Wayne. He’s got the intensity, the size, and the anger, but he also shows us the kindness and compassion we know Batman has deep down. Irons’ Alfred is a delight and unlike any other film adaptation of the character – he’s no longer just the butler. Amy Adams plays an identifiable, respectable, capable Lois Lane worthy of being called a hero as well. Gal Gadot captured the enigma that is Wonder Woman – I can’t wait to see more! Diane Lane provides a very necessary Martha Kent whom grounds the movie amidst all the spectacle. Holly Hunter also delivers a lower profile but instrumental role that had to be performed subtly. Laurence Fishburne is always great and gets some of the best lines in the film. Henry Cavill had the unenviable task of playing Superman. Though no one will every capture the charisma of Christopher Reeve, Cavill is giving us a conflicted, pained Superman – a Superman that is probably closer to what would really happen in the real world. He can’t be everything to everyone, and Cavill works hard to show us that nuanced inner turmoil. I believe Superman is a nearly impossible role because he’s such an international icon. Cavill will never make everyone happy – but that’s not on him. I think he lived up to the story and the script, and, in the end, he gives us a very heroic Superman. His Clark Kent/Superman is very much a partnership with Lois Lane, and Cavill shines when he’s with Amy Adams. But Jesse Eisenberg clearly got to have the most fun in this film. His Lex Luthor is also unlike any other depiction we’ve seen. Quirky, twitchy, weird, and creepy, Eisenberg made me squirm in my seat. His Lex Luthor is not a savvy businessman, he’s not an elegant speaker, he’s not charming, he’s not even charismatic – he’s just disturbing. I liked this iteration of the character very much. Honestly, in my opinion, Snyder’s strengths do not rest in directing actors or conveying story, but due to the sheer caliber of actors he worked with, they all shined in their own unique way. I think the fact that so many well-regarded actors joined this film confirms the faith they had in the plot and Snyder’s vision. So let’s talk about the story. For a film titled Batman v Superman, it has far more story than I ever expected. It plays heavily off of Man of Steel’s greatest failure – Superman’s apathy toward the destruction of Metropolis. (The visual of Superman kissing Lois Lane with human ash floating around them will never leave me.) This destruction fuels Batman’s distrust of Superman, which is totally consistent with the character. It sets up the very concept of the film and provides motivation. Of course, as all great comic book stories must, the two heroes slug it out, but, again, as all great comic book stories do, they eventually make their peace with one another. Was there ever any doubt? I personally loved the reason they make amends – I thought it was a brilliant bridge between the two characters. And, of course, now that the heroes are pals, they have to come together to defeat a common foe. This is a very simplified version of the plot. The movie takes its time establishing character, setting up the conflict, providing lots of motivation for everyone involved, and, thankfully, doesn’t rush the ending. Does this make for a long movie? Absolutely, but it didn’t feel long at all. I thought it went by really quickly. I was never bored, the multi-faceted story kept me engaged, and I didn’t once look at my phone to check the time or notifications. You also had to keep on your toes because the film constantly offered little hints of things to come. For a fan who’s followed DC Comics for over thirty years, these hints were a delight. The DC Universe is a very big place, it’s not even confined to one plane of existence, and Batman v Superman definitely laid the groundwork for many characters and concepts to come. Best of all, it gave the heroes a good reason to stick together at the movie’s end – it provided them both motivation and inspiration. Is this the greatest movie ever made? Of course not, but it lived up to its title, it depicted the characters they way I wanted, it provided far more story then I ever anticipated, the actors known for acting well did just that, it flew by despite its running time, the visuals were mesmerizing, and the comic book nerd in me delighted at the little hints of things to come. The negative reviews are wrong. This film will satisfy. 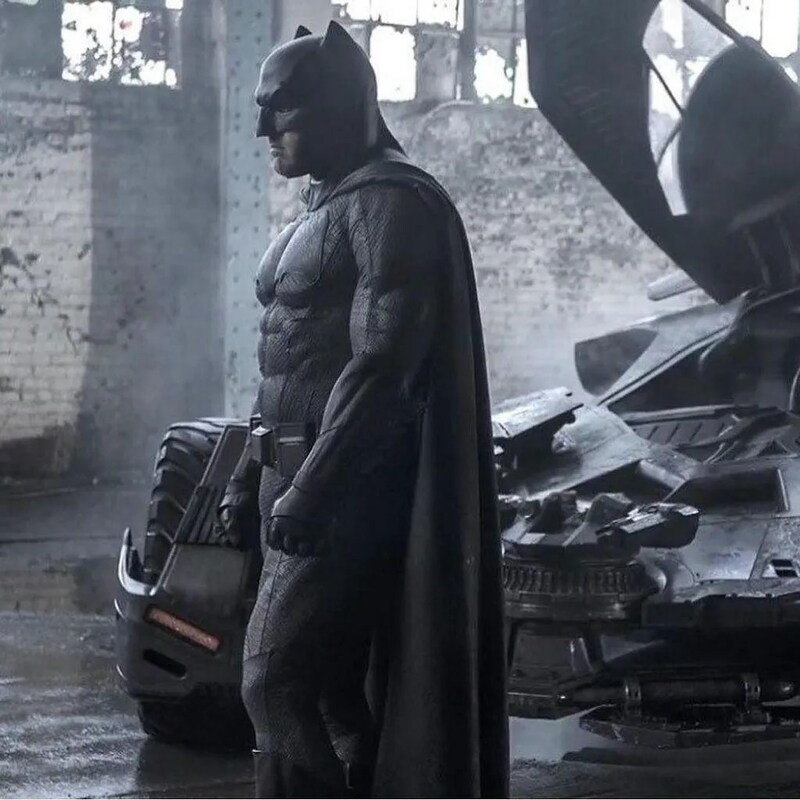 Today Zack Snyder released the first image depicting Ben Affleck as Batman for the upcoming Man of Steel sequel, tentatively titled Batman Vs. Superman. Though the movie does come out until May 6, 2016, it’s never too early to get the fans worked into a frenzy, and this photograph has apparently done just that. You know I love Batman. I love all iterations of the character. There’s enough love in my heart for the character to accept most interpretations. And concerning this image, honestly, I like where they’ve taken him. It’s already been established that this Batman will be an older and wiser, battle-hardened version, such as the Batman depicted in the critically acclaimed Batman: The Dark Knight Returns graphic novel, and this costume does much to evoke that series’ imagery. For example, I love that they have finally got a cape and cowl that seem attached to one another and organic to the man beneath. Best of all, his head doesn’t look huge because of his mask. It looks very sleek and form fitting. It’s good. I also like the over-sized bat symbol on his chest. Again, this looks like the one from the graphic novel, and that’s okay by me. The belt looks cool and useful. I love the little nuances of the costume/armor – the little lines and details. Snyder is an extremity stylized director, and the costume reflects that. Ironically, the costume is also far more simple than I expected. It does not look clunky with plates of armor, it does not appear awkward due to gargantuan headgear. Even the ears are more subtle. In fact, quit honestly, this looks like the most “comic book” version of the costume we’ve had perhaps since the 60’s television show. I hear rumblings that it would appear as though Jim Lee drew it, and that seems to be the case. Are there some things I wish they’d done? Sure. I’m a little tired of the all black Batman. Some kind of grey and black contrast would have been nice, or even grey and dark blue. I also miss the yellow oval included with the bat symbol as well. Finally, the white eye slits like in the comics would be so cool, but I get that they want us to recognize the actor beneath in some capacity. But, even having said all that, I am satisfied with this look. To me, it’s the most loyal to the source material we’ve had yet. I’m excited to see more during the next two years. I’d heard this was a very good movie and, as it turns out, I heard right. If you’re not familiar with the story of George Reeves, he is the man who played Superman in the old television series. I mean, the OLD television series from the fifties. Well, anyway, Reeves supposedly died from a self-inflicted gunshot wound to the head because he was so distraught at the fact he’d been typecast as Superman and couldn’t find any other work once the series ended. However, there have been theories abound that he did not in fact commit suicide, he had actually been murdered. Thus, in comes Hollywoodland. This movie deals with a private investigator, played by Adrien Brody, digging into the life of George Reeves, played by Ben Affleck, in order to find the true cause of the actor’s death. What he unearths is a longstanding affair with a studio executive’s wife played by Diane Lane. He also discovers that Reeves eventually left Lane’s character for a younger woman. Of course, you’re seeing all the angles on how and why Reeves died. The only question is, does Brody’s character find the true cause of death? At times this film is very difficult to follow because of some disjointed story elements as well as an affinity on the actors’ part for mumbling. However, overall, the plot is very good and the acting really is superb. Lane and Brody are always exceptional, but even Affleck, perhaps sensing urgency to prove himself, puts on a heck of a performance. He more than holds his weight with Lane, but his scenes with Brody, as you can imagine, are few.